Spring loaded clip and page stopper that can hold a stack of documents more than 2" thick. Designed for Atlas book and copy holders. Transparent so you can see the document underneath. Keep the pages turned when typing from stapled documents. Compatible with Atlas Standard and Atlas LC. Not available for Atlas-Ultra. The toughest and most versatile copy holder available. Hold large books or a single sheet of paper, at any height or angle. The toughest and most versatile copy holders available. Hold large books or a single sheet of paper, at any height or angle. The toughest and most versatile copy holder available. 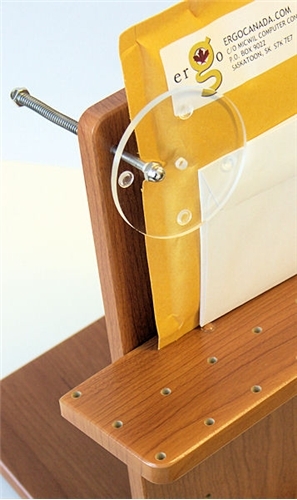 Holds large books or a single sheet of paper, at any height or angle. Designed for professional library use. Ships in 1-3 business days from our Novato, California office. Free local pickup from our Vallejo, California warehouse. By appointment only.